Jackie had been homeless for quite some time when she met the obliging man who offered her a place to stay. Although it seemed too good to be true, her desperation won and she agreed to move into his apartment. But soon after she moved in, Jackie grew suspicious of the man’s motives. Quickly, she discovered that his benevolence was a guise for a much darker plan: to sell her as a prostitute. As soon as she realized this, Jackie escaped. Although her name has been changed, the story is true. Linda Green, a Set Free Movement leader and director of Refuge Ministries in Wichita, KS, met Jackie at the weekly Bible study Linda hosts for women from a re-entry home. After hearing Jackie’s story, the link between homelessness and exploitation became undeniably clear to Linda. It’s a pattern that repeats itself across the country and around the world. And homeless youth are among the most susceptible. According to a study by Covenant House in New York, nearly half (48%) of youth exchanged commercial sexual activity for shelter. Overall, in the US and Canada, about one-fifth of homeless youth end up being trafficked. Instead of examining these kinds of factors, we sometimes compartmentalize an injustice as a racial issue, or a homelessness issue, or an unemployment issue. But when we fail to identify the intersections–such as how racial and gender discrimination overlap with mental health and physical ability–we can only ever apply band-aid fixes instead of engaging in long-term, holistic solutions. Human trafficking is not an isolated issue. It is a symptom of a much bigger problem of the brokenness in our community. Think of it as a “net” that catches a cluster of other issues, including racism, homelessness, unemployment, and more. If we want to end forced labor or prostitution, we need to bring healing to the root issues. Providing affordable housing is a key factor in preventing exploitation, especially in youth. However, with President Trump proposing $6 billion in cuts for public housing, the capacity of this strategy is limited. But what if programs aren’t the only way to create a safety net? What if human relationships are just as powerful? When relationships break down, so do other things. Children who are removed from broken homes and put into the social welfare system are more likely to experience exploitation. Depending on the location, anywhere between 50% and 90% of trafficked youth in the U.S. were in foster care at some point. And for the vast majority (95%) of young adults who are trafficked, there was some form of mistreatment in their childhood. About half experienced childhood sexual abuse. What does this tell us? That relationships matter. Relationships are not simply nice to have–they are powerful, even life-saving forces. Organizations such as Family Promise get that. Homelessness is a community issue, so it must be addressed by the community. Family Promise does connect families experiencing homeless with a range of services, but the process of immersing them in a supportive, relational environment along the way is just as important. Linda Green partners with Family Promise and a collaboration of other churches in Wichita to take turns hosting up to fourteen homeless people every night for a week. Church members provide them a place to stay and feed them breakfast, a sack lunch, and a warm dinner. Members play games with the children, help with homework, and build relationships with the parents. They share meals and laugh together. During the day, the parents can take showers, receive life skills training, and work with a case manager who helps them find a home and a job. This kind of compassion isn’t transactional. It’s not about the number of people fed or housed. It’s about being the hands and feet of Jesus, which is ultimately about entering into a relationship. It’s not about a program–it’s about shalom. That’s why Set Free Movement teams begin with building relationships and creating community before launching anti-trafficking projects. If community brokenness is root cause of homelessness and human trafficking, then restoring community is where we must start. Pray. Gather together a group of people and pray for the protection of youth and others who are vulnerable to homelessness and exploitation. Pray that God will do immeasurably more than we can imagine. Learn more about the link between homelessness and human trafficking. Sign the petition to stop budget cuts to public housing. Give to the work of freedom and justice. Gather a group together and read Urban Shalom. Find out more about how the faith-based community is leading the way in responding to homelessness. 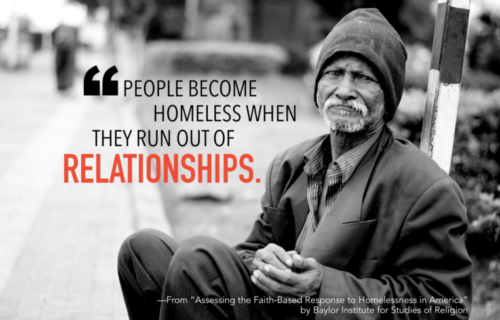 Encourage your church to get involved in addressing local homelessness. Participating in Freedom Sunday is a meaningful and practical way of bringing your church together. Invest in or mentor youth in your community to help build their confidence, positively influence their faith, and provide a safety net. Bring Family Promise to your community. What Does Restoring Survivors Look Like?